Wayne Smart, an Australian living in Dubai, posted this memory of his encounters with Helene Hanff to the Fans of Helene Hanff Facebook Group. I thought it was so lovely I wanted to share it with a broader audience and I knew that regulars of Hogglestock would enjoy reading it. I’ve posted it in total with Wayne’s permission. I became acquainted with Helene Hanff when I first saw the movie 84, Charing Cross Road in the mid 80’s. I subsequently went about reading every book of hers that I could get my hands on. As a university student in Australia at the time, all I wanted to do was visit NYC (something I have done more than a dozen times since). Helene’s descriptions of NYC made me long to go. After reading 84, Charing Cross Road several times, I decided to write to Helene. Problem was, I didn’t know where to get her address. (This was long before the internet). One night after a few gin and tonics, I decided to see if her phone number was listed. I decided to CALL her! I called the “International Directory” number and asked for NYC listings – there was only one H Hanff listed in NYC – I got the number and then dialed. A very friendly voice answered- I explained I was a fan – and that I was calling from Australia. Helene then exclaimed: “THIS MUST BE COSTING YOU A FORTUNE – HANG UP AND WRITE TO ME!!”….. I explained that I didn’t know her address. She laughed loudly and asked if I had a copy of 84. I said I did, and she said her address was printed on the top of every second page for the entire last part of the book (It was a book of letters!). I wrote to her in the late 80’s, and always received a lovely handwritten reply on a personalised post card. In 1991 I visited NYC for the first time. I called Helene, and we met at Rumpelmayers on Central Park South – (long gone now) for coffee. It was the most delightful hour. She was gracious, and regaled me with many stories. We shared a love for not only books, but also classical music. I continued to write to Helene throughout the 90’s, and in January 1997 whilst visiting NYC, I went up to 72nd Street to leave flowers with the doorman. He told me Helene was very sick and that I should go up and deliver the flowers myself, as she would like company. He said I would find the door open – and he called her to announce me. When I arrived up at her apartment, Helene was sitting on a couch near the window looking out towards 2nd Ave. She was obviously very sick – she appeared not very mobile. She asked me to fetch her some drinking water. I arranged the flowers. We chatted. She invited me to go into the alcove at the side of the apartment where there was a huge bookshelf. She said “go ahead – take down some books – touch them – they have brought me so much joy”. The original Marks and Co sign from the shop in London was on the top bookshelf. A few months later, in April 1997, a friend faxed me Helene’s obituary from the NY Times. 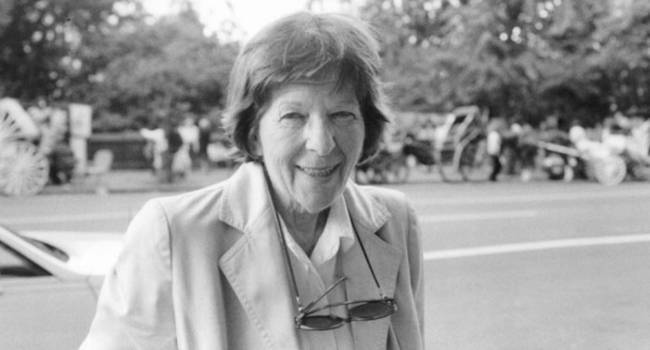 The headline was: “Helene Hanff, Wry Epistler Of ’84 Charing,’ Dies at 80”. Memories I will always cherish – and sustained by my occasional re-readings of her wonderful books. 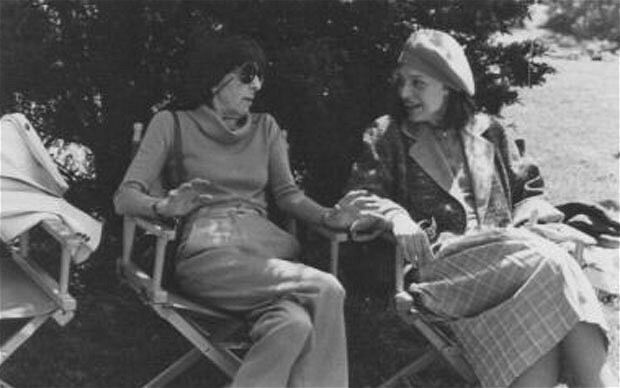 Hanff and Anne Bancroft during the filming of 84, Charing Cross Road–for most of us, the introduction to Hanff and her wonderful world. Lovely! Thank you for posting! This could be my favorite post ever. I love all of her books. What a wonderful story. I, too, read the book and saw the movie. While in London I went to 84 Charing Crosd Road. I recently finished her book of NYC essays, Letter From New York. It’s lovely to know how approachable she was in real life. Thanks for sharing. What a lovely story! Thank you for sharing! What a wonderful story. I love the bit about her saying the call from Australia must be costing a fortune! What a lovely post! Her books are just marvellous! Thank you so much for sharing this. What a beautiful story. I’ve only read 84, Charing Cross Road, but it’s a favorite. I remember going to The Strand bookstore looking for it and reading it on the train home. I had watching the movie years earlier and loved it. This makes me want to look for her others! She seems to have been an amazing woman. Yes, thanks for sharing this, Thomas. It’s nice to know that a favorite author was a nice person, too. I think a lot of us identified with her and her quest for knowledge and books. Thank you so much, Thomas, for sharing this wonderful post. I just posted about her book. How fortuitous of you to post on Helene Hanff. She’s one of my favorite writers, and in particular (84 Charing Cross Road) a favorite book of mine. You’ve a very engaging site here, I appreciate all of the work that goes into it, and I appreciate you being an avid reader. Being a new blogger, I’m looking forward to reading more of your posts. Have an effective week-end my friend! I hope you won’t mind me adding you to my blog-list? Thank you, Thomas, for sharing this. I once wrote Helene a letter and she answered me with a handwritten one. I still cherish it. Oh, this is wonderful – thank you so much for sharing it! Thanks for sharing this! Love all of Hanff’s books. I could hear my grandmother in my head when she said, “Hang, up, this must be costing you a fortune.” How times and phones have changed! Thank you so much for this – Hanff is a favorite author, and it’s lovely to spend some time thinking of her and her New York (and her London, for that matter…). Thank you for sharing this. She sounds like she was a lovely woman and I enjoy reading, and rereading her works. Charing Cross and The Dutchess were both enjoyable. Lovely post and great picture of Helene with Anne Bancroft. I must re-read 84, Charing Cross Road. I believe Helene was related to Jean Hanff Korelitz who wrote Admission another favourite of mine.